“Postsecondary readiness” refers broadly to preparing students transitioning from high school to the multiple pathways after graduation, or specifically to being ready for college. But there is little consensus on what the term means. How has the definition been validated by others? What kind of content does it address? How specific is the definition? 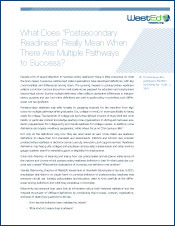 How does the definition address similarities and differences across multiple pathways? The college-going patterns of English language learners will not change dramatically unless students have access to, and success completing, college preparatory coursework early in high school. Attention to the progress of English language learners in both language proficiency and academic proficiency before they reach high school is essential to improving these long-term educational outcomes. 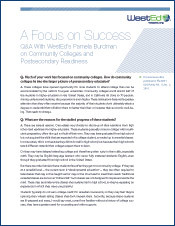 How do community colleges fit into the larger picture of postsecondary education? What can colleges do to help students who aren't academically prepared for college-level classes have a better chance of succeeding? Read this Q&A article.